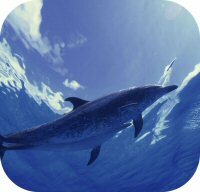 Dolphins can live in both fresh and salt water. There are five species of dolphins, that reside in large rivers like the Amazon and Ganges. Salt water dolphins species are found in a variety of water temperatures from tropical waters to arctic seas. The presence of dolphins are often an indicator of a healthy ecosystem and habitat.